We had several good candidates for this week's Hollywood HOs winner. We had Sean Penn's mind-boggling interpretation of the constitution and we had this week's Clooney-Obama lovefest (John Travolta's invitation was withdrawn) to raise money for Dear Leader's reelection campaign. 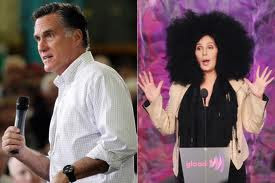 Got to give the better hair award to Mitt. None of this is surprising given that ad hominem attacks are simply daily tasks for the left. "Get up, take shower, get dressed, slander someone who doesn't agree with me." What I find absolutely precious are the news stories about Cher "apologizing". I saw a couple of them and thought here comes the standard, "I'm sorry if my words offended anyone. Personal attacks have no place in the debate over the direction of the country." "Sorry 4 bringing Wrath of Kahn Lovelies," she tweeted Tuesday. "Feelings [are one] thing but no right 2 let mean spirit run free! Anger in heart made me turn back on Luv"
As one of the founding fathers of the White Heterosexual American Males Only! (WHAMO!) movement, I am deeply offended. I am never buying another Cher CD or attending another Cher concert again in protest. Wait... I never done either of those things before. Oh well, everyone have a great weekend! "I've never done either of those things before"
That's because I like Sonny not Cher!